Discussion in 'UFOs, Aliens, Monsters, and the Paranormal' started by Ravi, Jan 13, 2019. I usually cover politics, but when Sam Chortek and Jimmy Chappie came to me with this exclusive UAP footage, I had to break the story. This video has never been seen by the public until now. The RAW FOOTAGE can be downloaded here: https://youtu.be/bVmGhxYrkug All Rights Reserved. 2019. For media inquires, contact BrianJosephHanley@gmail.com. New links to the "raw" footage soon appeared: https://uploadfiles.io/epai0 is an example. I made two screenshots, showing the object in "flight", it flys by from 2:33 to 2.35 approx. With these clear videos is I think we could do some calculations, or other advanced analysis? I am tending towards cgi myself. As I do not believe objects can move that fast without a trace, and a bug I also find crazy, so it must be added imagery, cgi. Actually I think it is just a bug. Here's an animation I quickly did of a bug sized object (1cm across) moving at a bug like speed (about 7km/h) towards an approaching camera moving at drone like speed (30km/h). For the FOV I used that of the DJI Phantom Pro 4, the forward camera of which is listed as 50 degrees. It's a bit rough, as it's late and I didn't have time to get the moving background added from the original video, or motion blur on the object, but I think it shows that a bug could be the source of the object in the video. I was going to try and do the same thing in Blender, I think people are confused by the fact that the scenery is moving so slowly, parallax strikes again. 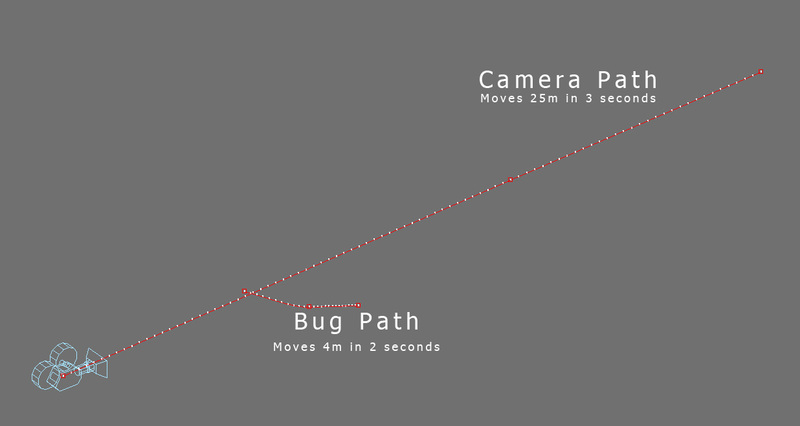 Here's an image of the paths of the camera and bug I set up in my 3D scene. Good points, purpleivan. I was also thinking about this option. I think your recreation is a good example on how to prove an argument. I would not be able to do it this quick, so thanks. Ive been following the different analysis out there on this video and just want to post this here. So far, from my searching, no-one has been able to definitively prove this is CGI.. some showing how they could do a very rough version of it as a fake but even with the raw video files and metadata, I haven't found definitive proof that this is fake. I also want to put these vids here for those who are convinced it is a bug. 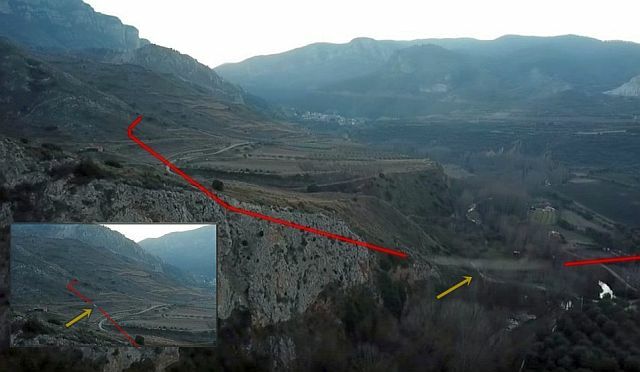 this one analysis video shows that that object goes behind the treeline way far back at the point where the object first appears... if this is the case, there is no chance it can be an insect as it would prove that the object does come out/over the mountain and goes below the treeline for a very short timeframe before zipping towards the drone. I am really trying to see if someone can prove, without a doubt, that this is CGI. IF not, as it appears, it could be a real video which then opens up a whole other can of worms, including WTF is it?!?! I see it disappear very quickly but that doesnt necessarily mean its that far out..
yea, it doesnt really mean much if it disappears anyway.. can you find the bright white butterfly in the lower left corner in this pic? I'll look for others tomorrow. With the fly vidoes in the above thread, if you change the backdrop (in your mind) to the OP (Opening post) video backdrop, it's easier to imagine that a bug nearby can look like it's far away. i only see what appear to be wing movement before it takes the big turn towards the camera. but that movement could just be a film artifact, the same way it (and my above butterfly) seem to disappear. hard to tell. Either way i dont see how it could be a spaceship because it's basically see through on the last frames before it flies out of frame, which is what happens with blurring but i doubt a big metal object can blur to see through. yea i see wings on the bug in one of @Mick West 's contrail videos and i'm a bit unbelieving that i can see wings on a bug as its flying so must be a lighting camera thing. If the wings are lit up you'll see them as a sort of flashing very fast strobe light, they tend to catch the eye. it just looks like, but it doesnt. if you move with 30km/h (as the drone does) forward and a small object (like a bug) comes directly at you and passes right at your eye (or the camera-lens), it will go from nearly invisible to huuuuuge in just seconds. think yourself on a bike or in a car...you dont see the fly/bug/whatever but right before it hits your eye (or windshild). its not cgi nor a superfast craft, its just an insect as far as I can tell. The linked YouTube video contains an analysis arguing that the object of interest cannot be a bug or a bird. It shows that at one point, the object does become completely obscured by ridgeline vegetation (refer to frame 6510, or 1:48.30 of the released raw .MOV footage). It does not show this. It shows that on one frame the object is not visible. But this appears to be because of noise and compression artifacts. Let's suppose for a second that this is true. How peculiar is it that the compression algorithm chose just that one frame in which to selectively truncate the object from the scene, when it wasn't truncated from any of the frames immediately preceding or following it, especially ones where the object is considerably less visible than it is in frames 6509 and 6511 (frames 6482-6496, or 1:48.02-1:48.16)? It's not odd, it's moving down to into a region of slightly higher contrast/noise, which changes the equation. The "hidden" frame is simply the last time it drops out, and hence the most noticeable. What if it's not an insect but a bird ? Wing flapping could explain the apparent disappearance when its far away without the need to assume a sudden increase in noise between two frames with relatively strong signal. During the turn it looks to me very much like a bird with a large wingspan (like a hawk or eagle). Even in the final very blurred frame when it passes closest to the drone there seems to be a hint of winglike structure. Sorry, I'd post stills of what I'm talking about but my video editing skills are a bit limited. The concept of contrast is antithetical to that of noise, not similar. An area of low or no contrast is generally indistinguishable from one of high noise. This is the basis of an SNR (signal to noise ratio). I'm not sure what you're implying there. As far as frames 6492 and 6493 (1:48.12 and 1:48.13), I would argue that no, it does not disappear. Here's frames 6489-6496 (1:48.09-1:48.16) inverted, looped forward and in reverse. To be honest, I can't really see it when the frames are moving forward either, but in reverse, the story changes. It's barely visible, but it's still distinguishable from background noise, and it actually perturbs the background directly behind it in a concentric manner. Frames 6492 and 6493 are problematic due to the object moving very little from one frame to the next. The point I'm trying to argue here is that the object has far more contrast (i.e. visibility) during frames 6509 and 6511 than it does during frames 6489-6496. Consequently, the video codec would be far more likely to interpret the object as background noise during frames 6489-6496 than it would during frame 6510, seeing as how the object has reasonably high contrast with the background during the two frames adjacent to it (6509 and 6511). It is highly unlikely that the codec simply compressed the object out of that one frame, as surely, it would have opted to compress it out of 6489-6496 first. but looks like a bird to me too. 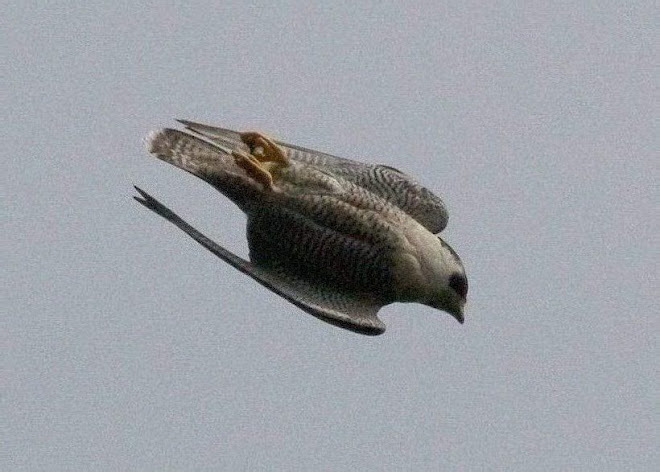 this ^ UFO believer is thinking it is a gyr falcon. 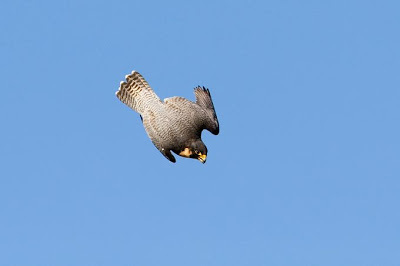 and he shows some gyr falcon footage, showing similar shaping. The concept of contrast is antithetical to that of noise, not similar. An area of low or no contrast is generally indistinguishable from one of high noise This is the basis of an SNR (signal to noise ratio). I'm not sure what you're implying there. Consider white noise. It's high contrast. Since the object is only 2-4 pixels at that point, it's not much different to the actual noise in the video. It is highly unlikely that the codec simply compressed the object out of that one frame, as surely, it would have opted to compress it out of 6489-6496 first. Codecs don't "opt" to compress things, it's based on an algorithm. In this case, it's the h.264 algorithm, which is quite complicated. Therefore if the artifact is a bird in a shallow dive towards the drone moving at around 15-20mph, the closing speed would be anything upto 150mph, and something that small (they aint large birds) moving at that kind of relative velocity is just going to be blur on the footage. As for the "bug or bird" question, I'm happy with either. Even though I've suggested it's a bug and made my render to explain the object in the video based on that, fundementally a bird is just a larger, further, faster "bug" as far as explaining the video is concerned. Could be some kind of very fast, but likely quite rare bird, or a more common one that is smaller, slower, but also closer to the drone. Bird or bug, the important thing is that they both provide a perfectly natural explaination of the object, without reaching for any kind of exotic source for it. I am still on CGI. The trajectory and behaviour of flight does not match with a bugs flight. The lastly posted "comparison video's" are entirely not identical to the Utah vid..
What specifically about the object's flight does not match the movement of a bug, or a bird for that matter? The movement in my rendered video is a pretty close match to the OP drone video, and the movement of the objects in that was based on the likely size and speed of a drone and an insect. Additionally the "bird flash fast" video has the same core characteristic as the OP drone video (the very quick whoosh past the camera), albeit at a different angle of movement relative to the camera/drone (greater vertical movement than the video in the OP). You know what they say about opinions. Don’t give opinions, give some proof it’s a bird or bug. No mumbo jumbo. Whatever it is, it’s actually faster near the end than when it begins, otherwise, someone could point this out. No flapping wings, too straight of a line after turn. I’m going to give my opinion since everyone else is giving theirs. It would have to be CGI if it’s not some vehicle or something we don’t know. Show decisive proof. The posters of the video have nothing to prove. I came here thinking I was gonna see an explanation. Like everywhere else, nothing. Providing an alternative explanation that is possible means that assuming a more exotic explanation is not exclusive. In the context we have here, providing a plausible hypothesis is sufficient. The original explanation is hypothetical as well. Now it's a matter of probability to decide which explanation is more likely correct. Only by exploring EVERY possible expliantion, can you even start to give any kind of analysis. 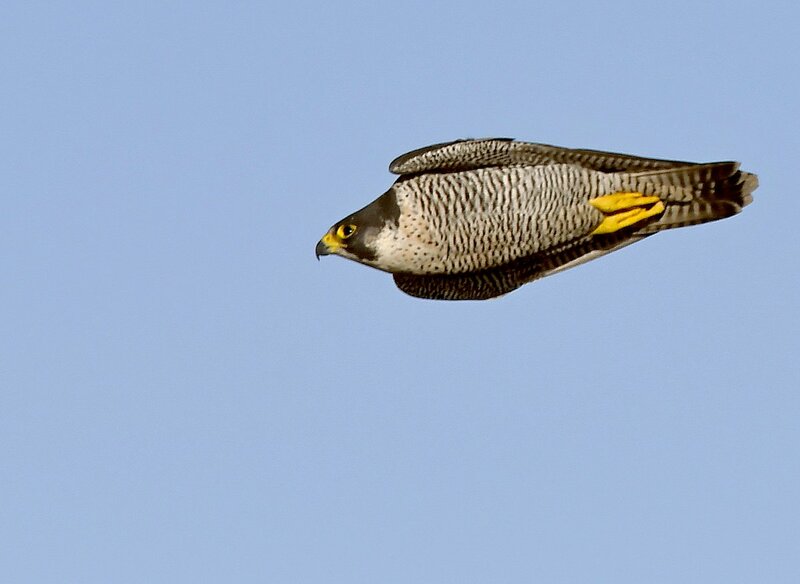 As for 'no flapping wings', birds of prey in a stoop do not flap their wings. The wings are held close into the body, and any wing movement is minimal alteration of possition, just enough to control direction without loosing speed. I believe that the video that I made demonstrates that the movement is consistent with a bug, or possibly a small bird if the speed and distance is increased. It's not mumbo jumbo, it's a simulation. The object does not need to be "faster near the end" as this is simply the illusion of the apparent speed of the object getting greater, the closer it gets to the camera. My video has exactly the same effect and the object in it is moving at a pretty consistant speed. The appearance of it moving in "too straight of a line after the turn" is just the product of its rate of movement across the frame. With such a small number of frames of video where the object is very close to the camera, the movement appears straighter, as there is much less time for movement to take place (how much vertical movement would you expect in less than 1/4 of a second). As for there being no discernable wings, if it's a bug then these would not be visible due to the very high rate at which they beat. In the case of the object in the OP video being a small bird, the object is very small in the frame (just 2-4 pixels) for most of the video, so again wings would not be discernable. It is only in the last few frames that the object is close enough that bird wings might be seen, but the rapid movement across the frame, creates motion blur, that can remove detail such as beating wings. Could it be CGI... sure. I could take my render set up, improve it by adding motion blur and better lighting, then slap it on top of some drone video. But that would take time, and someone to want to do it. What doesn't require any work or inclination is it being something natural like a bug or bird. In fact, there's a variety of similar videos on that site, all labeled "fastwalker"
It seems like "fastwalker" is the 2019 equivalent of the "rods" of a decade or two earlier. A semi-random visual artifact that people started seeing once a certain technology got sufficiently widespread. For rods it was crappy digital cameras. For "fastwalkers" it's drones moving past a bird or a bug. Motivated reasoning is going to keep people thinking these are 4,000 mph UFOs. What we need is a nice general purpose "fastwalker simulator" to demonstrate how each occurence happened. We also need a better name than "fastwalker"
They are just rods all over again from what I can see, just cameras on drones detecting them in videos this time rather than single images with motion blur. Same thing, a moving object smeared by motion blur and made to look fast by being close to the lens. We should be able to simulate it in 3d modelling software as long as we can simulate the camera motion blur. A tad prejudging though. I was thinking “zipby” and a specific “drone zipby” (as in something that zips by the camera). Zipbys are the new rods. Or maybe some drone owners could deliberately fly through areas with swarms of insects, to capture some known bug footage to compare these things to? I am completely for any earthly explanation or CGI but the last responses in this thread more or less say "well it is bugs, so shut up". This is I think not the way we should tackle the problem. I thought we should explain things by proof using models and simulations that without doubt explain the video of the subject. No?